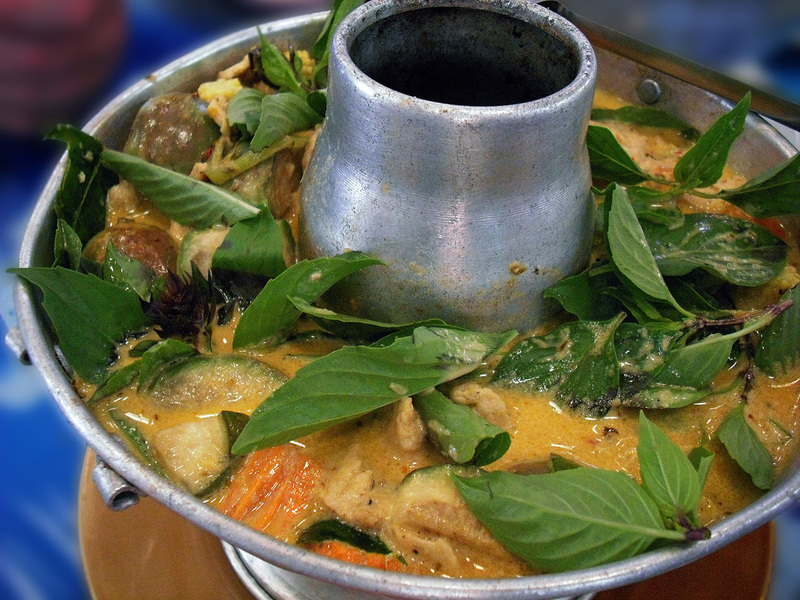 Anyone who has ever visited Thailand will know that the difference between a Green Curry (Gaeng Kiew Wan) in Thailand and one in the West is like comparing Black to White , there`s simply no comparison. Our Western version just doesn`t have the textures or the aromatics of the Oriental one by a long mile. 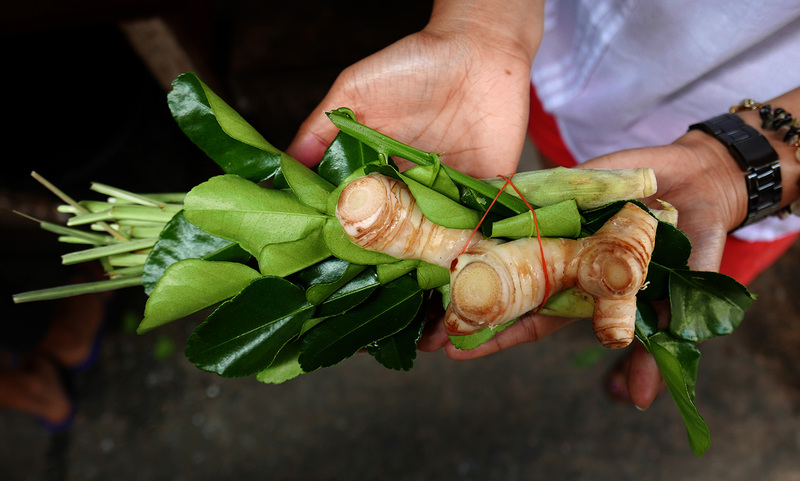 The photo below shows the 4 essential ingredients needed to give this legendary Asian curry its characteristic signature. 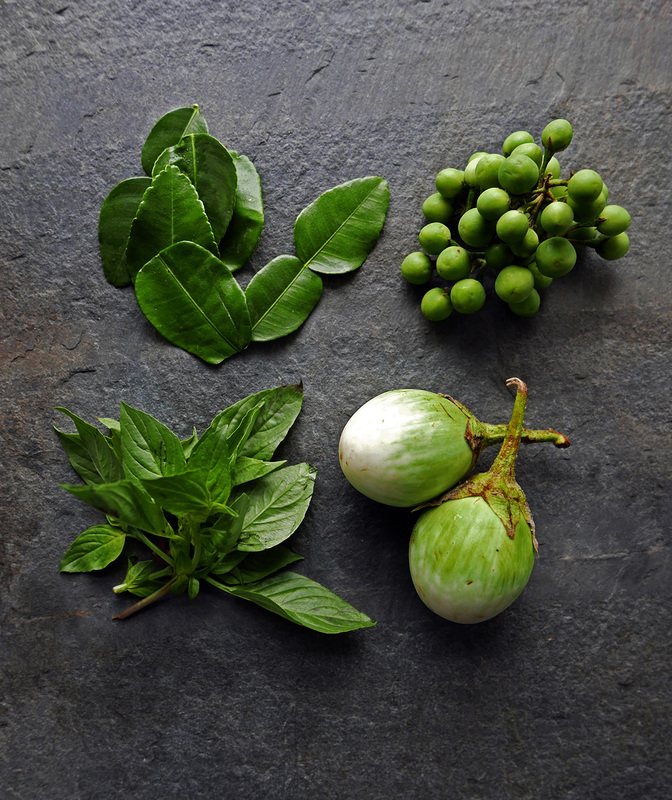 Eggplants , Kaffir Lime leaves , Pea Aubergines and the delicate Aniseed scented Thai sweet Basil. 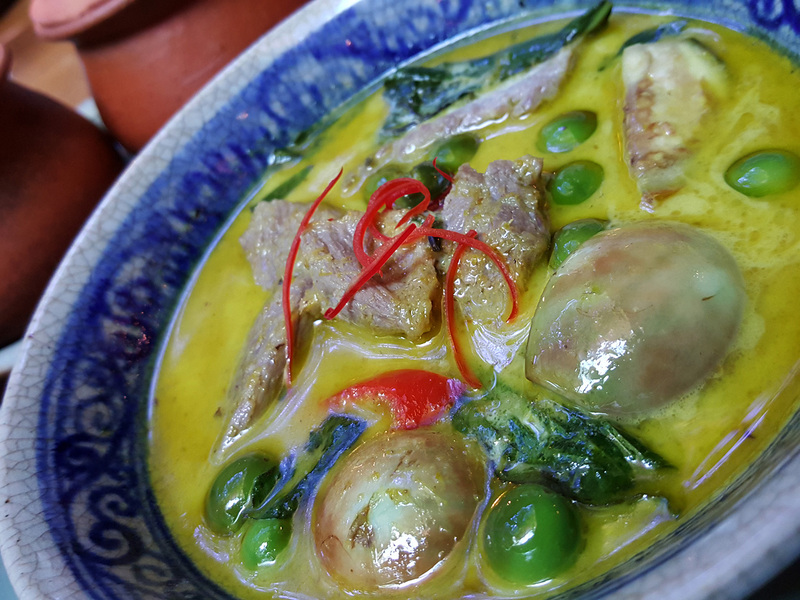 Unfortunately in the UK we can only obtain these ingredients in Oriental supermarkets or through an online supplier but if you really want to re-create the flavours of an authentic Thai Green Curry then these 4 ingredients are absolutely essential. 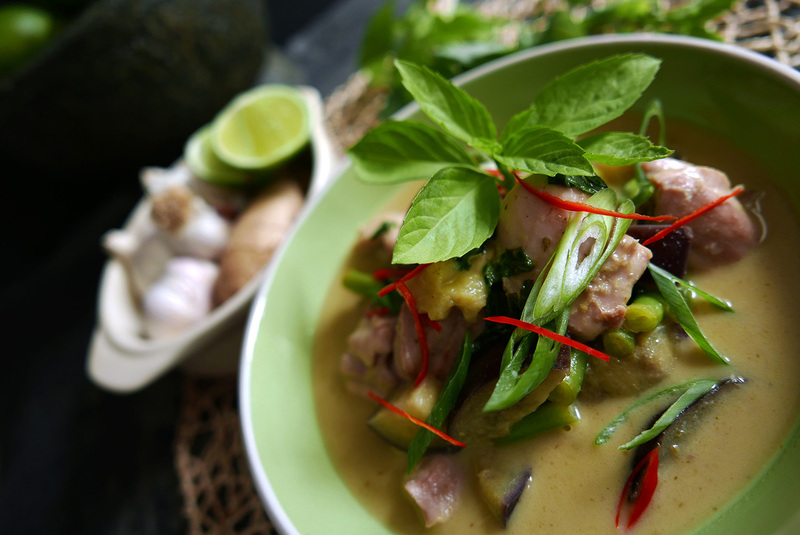 However , after more than 45 visits to Thailand and eating many different variations of this classic Thai delight , I like to think that my own adapted “English“ version of Thai Green curry is pretty similar to the `real deal` . 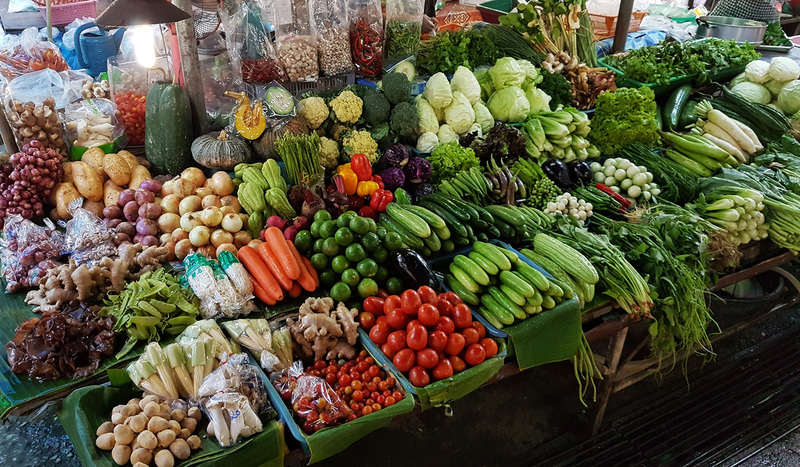 It`s definitely as close as you`re ever going to get without the fresh Thai produce and hopefully if you try this one at home then you`ll be pretty impressed at the result. There`s always a better idea though , book a flight to Bangkok and go try for yourself. Here`s my version below using Chicken as the main ingredient. You can use Pork , Beef or Seafood but Chicken always seems to be the favourite in Thailand. Feel free to substitute the Chicken Thighs with thinly sliced Breast meat. I personally like to use the thigh meat as it carries a lot more flavour. 2 Tbsp. Vegetable / Sunflower oil. 1 Tin of Coconut Cream or thick Coconut Milk. 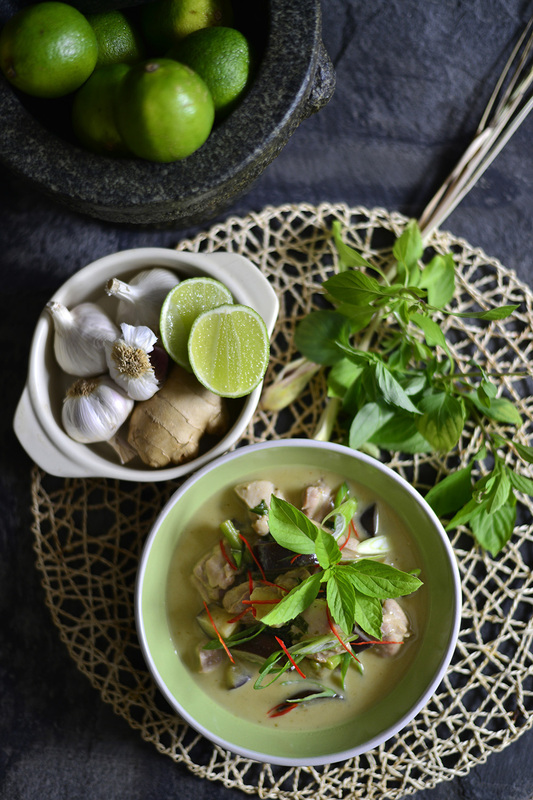 To finish the Curry – Fish sauce , Lime juice , soft Brown Sugar used to balance the taste. 1 Large Red Chilli and sliced Spring onion for garnish. 1, Heat the oil over a medium heat and add the Green curry paste. `Gently` fry the paste in the oil , stirring constantly until it becomes fragrant .This takes 1 to 2 minutes but take great care not to burn the paste or you will have to begin the recipe again. 2, Spoon off a couple of tablespoons of the thick cream from the top of the Coconut Milk and set aside. Pour the Coconut Milk into the pan and mix into the Curry paste. 3, Bring to the boil and then add the Chicken thigh meat , Sugar , Fish sauce , Lime juice and let it all bubble away gently for five minutes or so until the Chicken turns colour and cooks through. 4, Add the chunks of Aubergine and the Green Beans (cut into 1 inch pieces.) then continue to cook through for another 3 to 4 minutes. Add most of the Basil leaves and then remove from the heat. 5, Taste the sauce and then have a good think about it . Is it too Salty , too sweet , too bitter ? There should be a perfect balance of Salty , Sour and Sweet with no flavour dominating. If you need to balance things up then simply add more Fish sauce (Salty) , Lime juice (sour) and Sugar (sweetness) to suit yourself and to make your personal Curry unique. You should be able to taste all the individual flavours when you sample the finished recipe but remember….NO FLAVOUR MUST STAND OUT. 6, Lightly Stir in the Coconut cream that you have set aside and then serve. 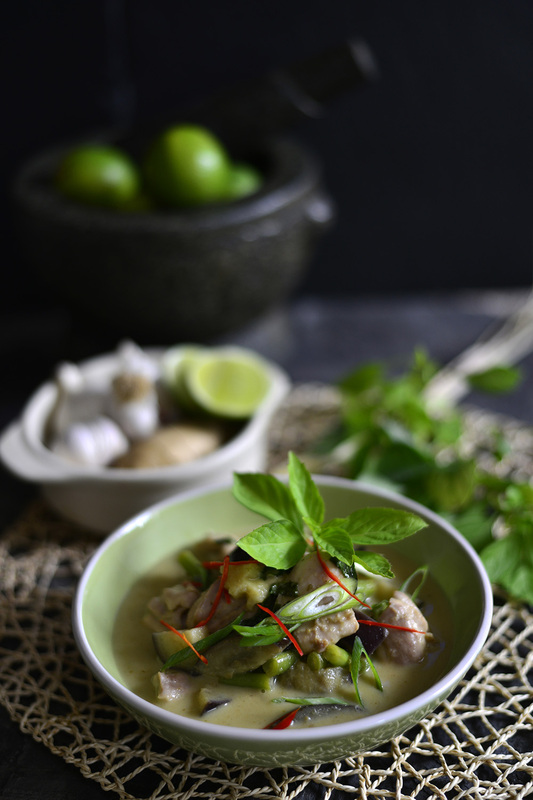 Garnish the top of the Green curry with fresh Basil , fresh red Chilli and sliced spring onions. 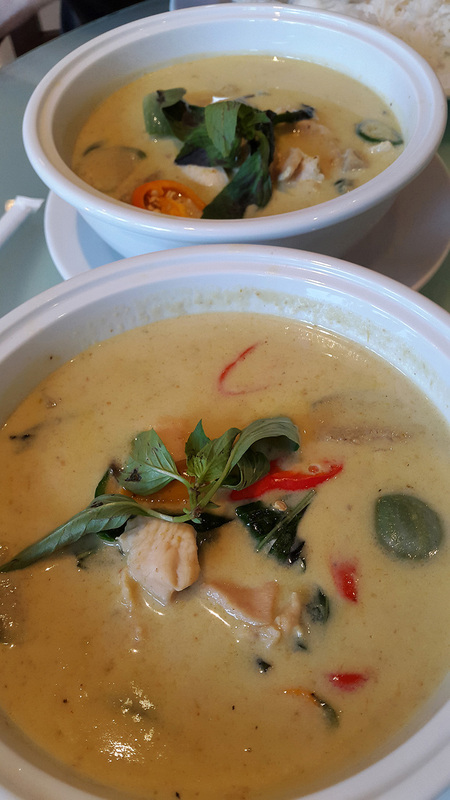 The perfect accompaniment is simple….. Thai Jasmine Rice. 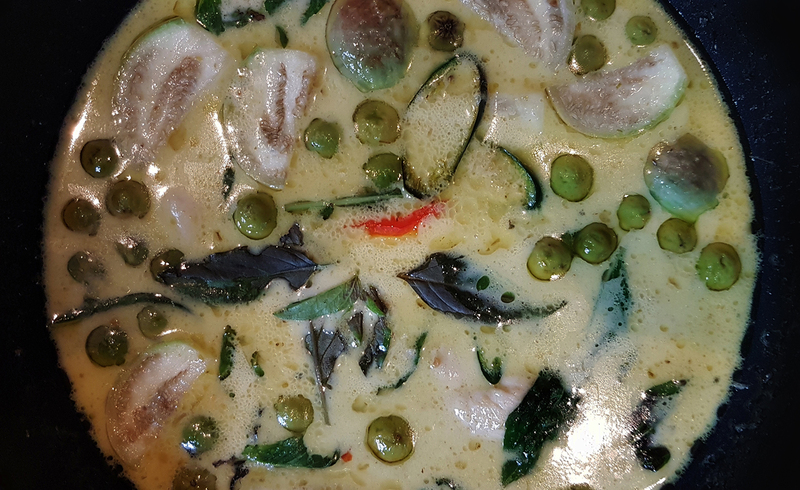 So there you go and I really hope you enjoy my Thai Green Curry. As I mentioned above , there`s so many versions of this Thai Classic and none of them are the same. Everyone makes different variations so just have fun making your own. 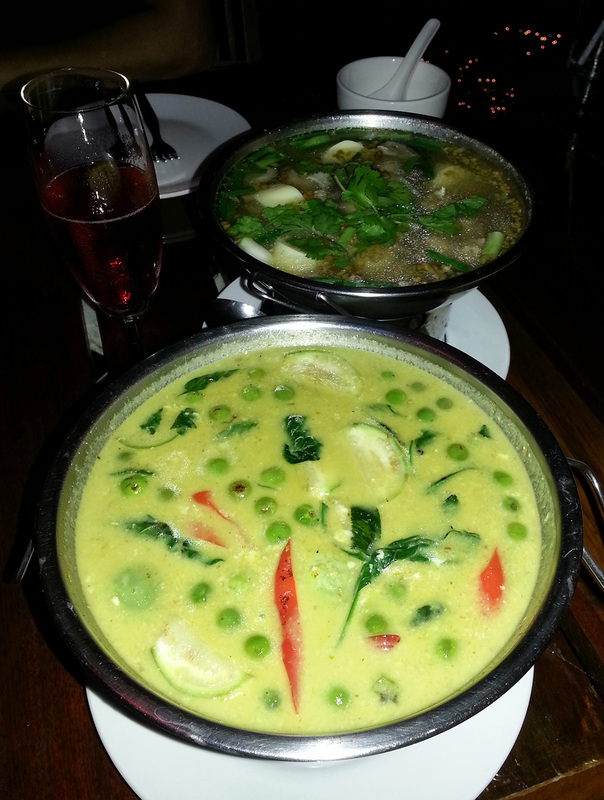 You can see in the photos below just how much this curry varies from restaurant to restaurant. Some like it creamy ( like me ) and a lot of places serve it watery and more like a soup. Hey ….They`re all good in their own way. This one was served on a Bangkok night market street food stall. The 5 star Bangkok Marriott hotels version. The Marriott again but with a different Chef. 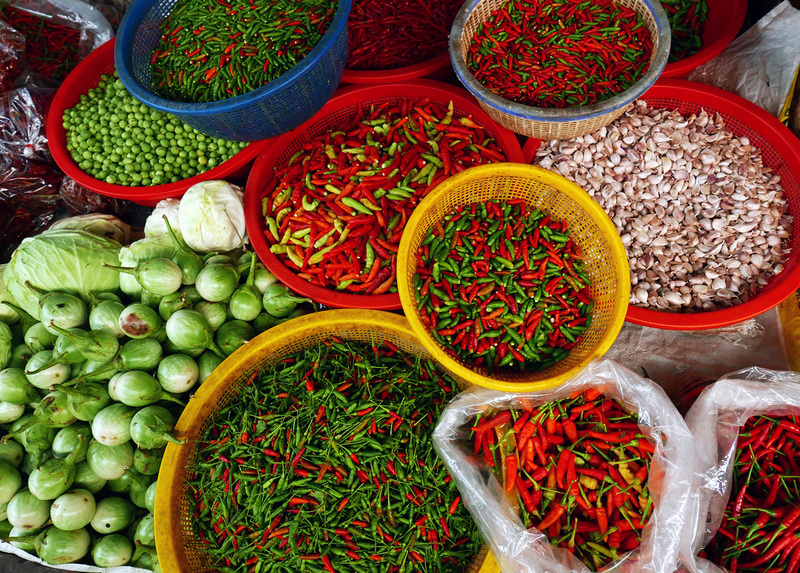 What tends to help a lot when cooking Thai food is the daily markets. When you have produce like this available it`s really hard to go wrong. Previous Post The Ritz Restaurant – Again.